Why is everything an ISSUE? She used ISSUE about 14 times. How about PROBLEM or TROUBLE? OOOH no, just asked my 14 year old and he said words like Problem and Trouble are too harsh. GOT IT! Too old I guess. As long as they keep building Jewish settlements on Palestinian land, Israel deserves every rocket they get....and more. They really think that killing thousands of Palestinian men, women and children is going to stop attacks on Israel???? Just the opposite will happen. They are creating thousands of enemies for every Palestinian they brutally kill. what Palestinian land? The Jews have been there 2 to 3,000 years before Palestinians even existed. Besides, no one, even the neighboring Arab states, knows why there is a Gaza in the first place. It does not make anything, it does no trade of any kind, it has no purpose. They could, however, build hotels and resorts and develop a great tourist industry on that great location. They're just too busy being hateful and miserable. What kind of life is that? "This is not an ask or a standard that is uncommon, that a country like the United States or a country like Israel should hold itself to." What is this situational ethics this Jen Psaki speaks of? We (the United States) bombed the ever living life out of tens of thousands of Iraqis. Who is the United States to speak of war zone standards? Ok, so its time to blame worldwide Jewry. Sounds familiar to me. I'm a German and I know from our own history how this works. The Jews are blamed for everything. – This is despicable, but then it is also typically Nazi. This kind of hatred should be looked carefully at by CNN. But CNN acts sometimes like its ok to be a terrorist in Gaza, booby trap homes of innocent civilians and have large weapons cashs in mosques (which should be a house of prayer and a safe haven for the worshippers of Islam). Jews bashing has a long tradition in several religions and factions of these religions. Believe me, all that Israel wants is living in peace. Hamas doesn't care – they want another holocaust for Israel. – If we had a Gaza Strip close by and somebody would fire rockets on our cities here in the US I wonder what the response would be. I'm sure nobody would give a flip about somebody telling us to answer responsibly. The military didn't aim at the UN school. Hamas fighters conveniently did hide out close by to raise the civilian death toll while Israel is condemned for defending itself and the peaceful Palestinian people. I have Muslim, Jewish, Christian, Hindu, Atheist friends and I firmly believe that at its essence, the Muslim Faith and the interpretation of the Koran has not really evolved unlike Christianity and Judaism for instance. On the surface, the Muslim leaders practice the "when in Rome" doctrine outside their own countries for the most part, but inside, they still go by the Muslim tenants from before the Dark Age. Way they do not trust their own people and show that they understand what value the freedom of thought and of choice has and make more and more room for it? Unless they completely shut down satellite transmission of video and radio signals along with the Internet, one day they will realize that most of the worthwhile individuals in their society have gone abroad and what's left is only good enough to re-create and go back in history with the strictest, some term it barbaric, laws imaginable in the 21st Century. OR – they'll loose everything – chaos will ensue, and new dictators emerge. Most Palestinians simply want to have a place to live in safety, feed their families and enjoy a life little to the best of their abilities. That's all the Jews want. That's all every human being desires regardless of where they're from. Freedom is the most evolved human concept and condition. It never ceases to amaze me how pre-programmed these spokes people tend to be and/or how little English they seem to actually how to use – in particular at the State Department. 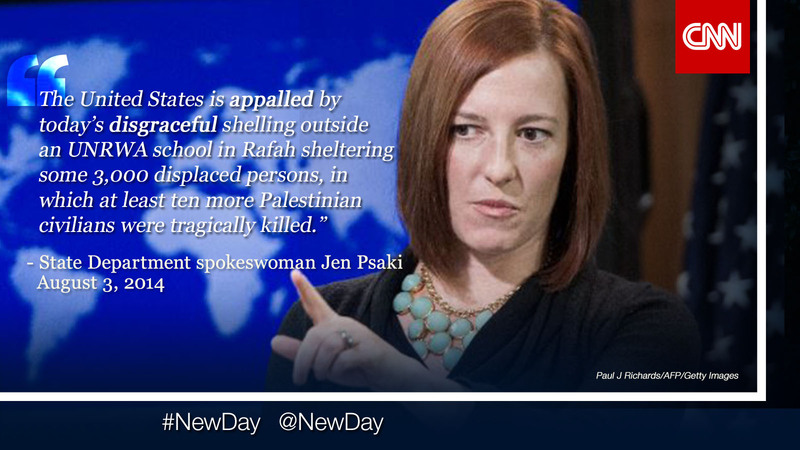 The question I have for Jen Psaki is: is there such a thing as a "graceful" shelling? america has to stand up to israel and jews in its midst in a concerted effort because right now israel has a free check to do whatever it wants to anybody. i think the fact that so many jews are in office in america represents an undue influence to commit these heinous acts and get away with it. the jews are not holy. if you are a christian you cannot condone this behavior and still be a christian because you are basically selling out your faith to jesus christ and saying you don't believe in the faith you were raised with. the christians are acting like everything that netanyahu says is direct from god. as if he is the pope, who the media made an effort over many many years to discount. now i expect you to let go of the jewish influence that is controlling your mindset and if you can't do that then you are dooming america to lose its decency and free will. oh by the way, the jews who run the media and hollywood have been progressively taking away yoru morals. the least they could do is rebel against their own jewish leadership.